The stable is designed to capture the reality of the humble stable where Jesus was born. 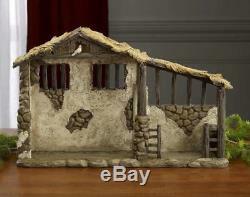 The stable depicts stone and stucco walls, weathered log beams and posts and a humble, palm thatched roof. The hay strewn floor and trough imagines the very stable behind the inn on that first Christmas. 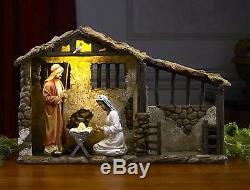 Included in the stable is a light that shines down on the manger below. Made of high quality polymer resin stone and hand painted. Stable lights up and runs on batteries. Batteries included and comes in nice box for easy storage. Perfect size for 14 Nativity set. Size: 25"W x 15"H x 7D. The item "Christmas Nativity Lighted Stable for 14 Nativity Set" is in sale since Wednesday, October 3, 2018. This item is in the category "Home & Garden\Holiday & Seasonal Décor\Christmas & Winter\Nativity Items". The seller is "sincerelyhers2010" and is located in Bainbridge, Indiana.